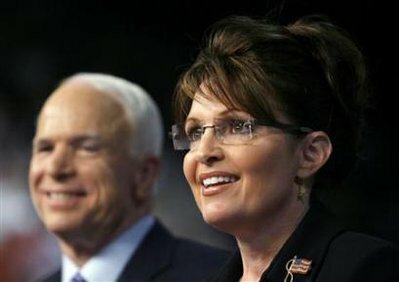 McCain-Palin Head to RNC in Minneapolis-St. Paul | the "silent" majority no more! From The Silent Majority: Sarah Palin is the working mother of five, pro-life , has a son in the miltary AND she actually has Executive experience! (Predictably, the silliness of the the press rolls on) The MSM falls all over itself attempting to declare this marvelous woman to have less experience than BHO. (laughable) TSM celebrates this fantastic choice as Vice President. A woman who has defeated a corrupt Republican political machine in Alaska. A member of Feminists for Life. Wife and mother. Thank you, Senator Mc Cain! Days before being announced as the Republican party’s first female candidate for Vice President, Alaska Governor Sarah Palin was asked by Maria Bartiromo (CNBC.com) if she was on John McCain’s short list. “…Reporters who decline to press Mr. Obama for more information now, whether it be on William Ayers or the Rezko-Auchi partnership, may be repeating an old mistake. Most reporters failed to dig deep enough into the Nixon White House’s handling of Watergate before the 1972 election. The country was soon consumed with that scandal. Most reporters pooh-poohed questionable Whitewater real-estate dealings of the Clintons before Bill Clinton’s 1992 election. Within months of his inauguration a tangled controversy led to the appointment of a special prosecutor and an endless source of distraction for the Clinton White House.